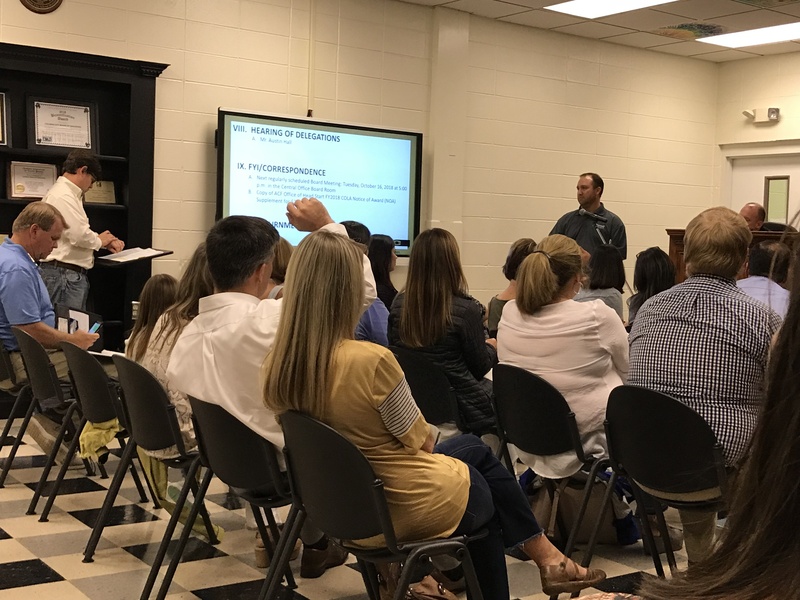 Updated 9-14-18 at 8:30 a.m.
CULLMAN – It was standing-room-only Thursday night at the Cullman City School Board meeting, where at least 15 frustrated and concerned parents were in attendance to voice their concerns about what they said is a lack of communication concerning an alleged mold problem at West Elementary School. The mold is a result of the March 19, 2018 hail storm and summer rains that occurred when the school had temporary roofing. The parents said they were not informed that testing for mold and asbestos was ongoing while their children were in school. They also questioned why test results were only obtained this month, when testing began in May. In a statement to The Tribune on Friday morning, Superintendent Dr. Susan Patterson said, "Our first priority is to provide a safe learning environment for our students, faculty, and staff. The board approved the roof repair plans drafted by architects and released bids for a contractors in late spring. At that time the board also approved to contract with professional services for testing air and surface quality within the school and cleaning. As work has been completed we have followed the testing protocols per the certified and appropriately licensed professionals, who were also in attendance at our meeting to discuss parent concerns. Additionally, we have had professional cleaning completed in rooms as a preventive measure to ensure the safety of students and staff. The board welcomed the dialogue with parents and community members, and I will work with Dr. Page and other staff members to give the proper communication as we complete the repair and any other necessary activities. Any time you have a natural disaster there are unknowns that arise during the recovery phase, but we will continue to address those to maintain the safety of the schools for everyone." At the board meeting, parent Austin Hall, who spoke on behalf of the group, asked the board, "Why are you continuing in a manner that is reckless?" He questioned why the board was having "selective testing" done, "rather than taking an aggressive approach to a potential health threat at the school to teachers and students." Madison-based Terrell Technical Services, Inc. (TTSI) was hired by the school board after the hail storm to conduct what TTSI calls “Limited Indoor Environmental (Fungal) Assessments” at West Elementary. The assessments were conducted on May 16, 2018 and Aug. 13, 2018. TTSI submitted its report and recommendations to the school board on Monday, Sept. 10. Neil Matson, VP of operations for TTSI, attended Thursday’s school board meeting to answer any questions parents or teachers might have. Conclusions of the visual inspection, appropriate moisture surveys, and fungal sampling revealed no evidence of substantial fungal contamination within the structure. Obvious water intrusion issues were noted where roof leaks have impacted the structure. Water damaged and water stained ceiling tiles were noted in several areas. It should also be noted that the facility has a double ceiling, so additional water damage / water staining issues are also impacting the upper concealed spline ceiling. However, no significant visible fungal growth was noted on surfaces within the inspected areas of the buildings. A few samples from each assessment event did recover fungal spore concentrations considered to be above background levels. This included the surface wipe sample collected from the HVAC unit servicing room 13 and the air samples collected from the northeast hallway, west hallway, classroom 7, and classroom 9. These samples recovered slightly elevated concentrations of Aspergillus/Penicillium group organisms when compared to typical background levels and/or the outdoor air samples. It was also noted that the air sample collected from classroom 7 recovered a trace concentration (1 fungal spore) of Stachybotrys. No Stachybotrys was recovered from the outdoor air and Stachybotrys is not typically recovered from indoor air samples. Reportedly, the HVAC systems servicing the facility are due for cleaning of the coils. The recovery of elevated fungal spore concentrations from the HVAC cooling coil surface wipe sample confirms the presence of significant particulate accumulation and some fungal growth activity. This is determined to be a minor maintenance issue and is not likely associated with the roof leak issues. However, given the extent of particulate accumulation, it was recommended that the HVAC units as well as ductwork be professionally cleaned. Given the slightly elevated concentrations of Aspergillus/Penicillium group organisms from classrooms 7 & 9 and the hallway areas, it was recommended that remediation efforts in these areas be conducted by a professional remediation contractor. Although no significant visible fungal growth was noted on surfaces within the subject rooms, it was determined that fungal growth may be present on portions of the impacted ceiling materials in these areas. Due to similar conditions in the conference room, it was determined that professional remediation was also warranted in this area. Although the air sample collected from room 7 did recover Stachybotrys, the concentration is considered minimal and does not indicate an additional concern of significant contamination. It is possible that limited Stachybotrys growth is impacting a portion of significantly wetted cellulose ceiling tile. Additional areas of water staining were noted within the facility and it is generally recommended that water stained ceiling tiles be removed and replaced. It is also recommended that any water stained wall surfaces be cleaned. However, it is recommended that remediation efforts in the conference room, classroom 7, and classroom 9 be performed utilizing negative pressure containments and an experienced mold remediation contractor. Remediation efforts were determined to primarily include removal of ceiling materials and any exposed ceiling cavity insulation impacted by direct water intrusion and potential fungal contamination. It was also recommended that the HVAC systems servicing these areas be professionally cleaned. Upon completion of remediation efforts within these areas, it was recommended that a post remediation assessment be conducted within the conference room, classroom 7, and classroom 9 to evaluate the effectiveness of the remediation efforts. Hall continued, saying there had been numerous complaints from other parents, including children coughing and having a strong musty odor in their clothes, hair and backpacks after leaving school. Another parent spoke of the difficulty of removing the odor from her daughter’s clothes and backpack. Matson acknowledged that all classrooms have not been tested for mold but said asbestos testing had taken place throughout the school and will continue as work is being completed on the school’s roof. Two areas that were potentially contaminated with asbestos had been sealed off from students and teachers. The areas were tested Monday and no fibers were found. Parents were upset to find the seals to those areas broken before test results were known. They said it allowed the hallways to possibly be contaminated. Several parents at the meeting implied that the response to the damage at West Elementary was not met with the same sense of urgency as the damage done to East Elementary. Parents were visibly frustrated and nervous about the safety of their children, repeatedly speaking out about the uncertainty that exists while the tests are not completed and clean up from the water intrusion continues. Parents also asked Terrell to provide them with reports that are less confusing and in terms everyone can understand. The day after the hail storm in March, in a special-called meeting on Tuesday, March 20, 2018, the board declared an "emergency situation" so that Patterson could proceed with the repair and replacement of damaged roofing at West Elementary. Here is the official wording of the emergency situation declaration, which was procedural and intended to allow the superintendent to move quickly to authorize repairs: "Due to the hail storm on March 19, 2018, which caused extensive damage to roofs at West Elementary School, and which will result in a danger to public health and the safety of our students/staff if repairs are delayed, the Cullman City Board of Education hereby declares this an emergency situation. By declaring an emergency, the Board authorizes the Superintendent to proceed with the repair/replacement, per recommendation of the Board architect, of roofs at West Elementary School based on emergency provisions of Section 3922(e) of the Code of Alabama."